This card has been discussed in a number of forums, discussion boards and collector blogs over the years. I’d like to contribute my input because after 20 years, I finally located and secured an example for myself and I want to talk about it. 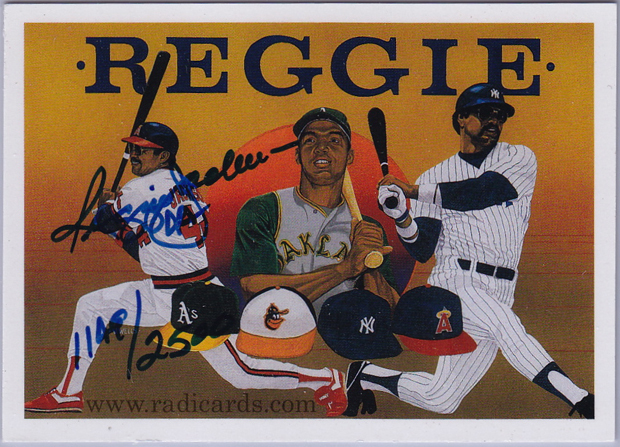 We're talking about the signed header card from the 1990 Upper Deck Reggie Jackson heroes set. Let’s recap on the history behind this famous and somewhat underrated release. To my knowledge, this is the first certified autograph to ever be inserted into packs within the entire hobby of sports cards, if you know otherwise, by all means, enlighten me. Although this card is serial numbered to 2500, the odds of pulling this card are stacked army strong against you. Additionally, 1990 Upper Deck was upper-middle tier for a release from that year but, like it’s competitors, it was still way over produced. If in 1990, this card, #d to 2500 was almost impossible to pull, I’m guessing that the Upper Deck print run was easily in the millions. If that were the case, it would justify the hopeless difficulty in pulling this card. Ever since this card was introduced into the hobby, auto’s and serial numbers have become the standard and in some cases, pass. They are released into almost every single sports card released in today’s market. So much so that they are one of the only selling points for many of these products. This is why, in today’s market, many box labels are plagued with phrases like, “3 memorabilia or 1 auto and 2 memorabilia cards in every pack.” Where’s the romance in something that’s found in day-to-day routine? Back in the late 90’s, auto cards still held some form of integrity because they were still moderately difficult to obtain. Today, auto’s can be had for as little as $2-5 at shops and shows every day of the week. Also, auto’s are no longer only from big time HOFers, but instead, anyone who’s in uniform gets a chance to be depicted on a signed card. This trend is today’s version of the late 80’s infamous over-saturation model. Instead of printing a billion of the same Tom Glavine RC, we are printing hundreds of thousands of signed rookie auto cards of anyone and everyone. When I was a kid and I saw an autographed card at a show, I stopped and drooled over the card and thought how rad it would be to have one in my collection. I think this romance occurred because auto’s were very hard to find! Today, when I walk by and see auto’s for $5, I usually have a “who cares” mentality and just keep walking. I think my antipathy stems from the fact that these cards are everywhere and I get tired of seeing them every year. The auto/memorabilia and serial numbered thing is, in my opinion, a fading(ed) fad. It’s an idea that’s been recycled thousands and thousands of times since its inception back in 1990 (1997 for memorabilia). It’s a tired trend but apparently, it’s the best the hobby can do. I always joke about the ‘next big thing’ in sports cards. Perhaps it’s just a matter of time before we find a subset called, ‘Own a Piece of the Player!” This subset could include “memorabilia” to the tone of blood samples, finger prints/nails, earwax, boogers, hair strands, ____ and the like. Does it really matter what you put in there? Whatever the case, the idea is sure to be recycled a billion times over until it’s resorted to the $5 bin at the local hobby shop (if shops still exists by that time). Produce less (Quality over Quantity). If the hobby focuses more on producing fewer insert sets, fewer autos, fewer (fill in the blank) like it once did in the distant past, the perceived value of said product may increase. Additionally, if an insert becomes hard to find again like it was in 1990, it’s likely to re-introduce forgotten collector romance. That feeling of pulling that one big hit that was inserted at a rate of 1/20 cases! Produce fewer parallels. The 1/1 completely lost whatever scanty significance it had left when Topps introduced Moments & Milestones. Let’s look at this set from a saturation standpoint. If Frank Thomas has a card for each of his home runs from 1-500 and each of those has a white, Black, Blue and Red parallel, that means that there are 2000 different versions of Frank Thomas cards to be had in the 2008 M&M set. Tag onto that four different color press plates to go with each of the home runs and you’ve got another 2000 Frank Thomas cards. That’s a total of 4000 different parallels of Frank Thomas to be had for just that set alone! Re-introduce performance-based only inserts (auto’s, memorabilia, whatever). When everyone and their mom’s get to have their own autographed cards, the integrity of the autograph is significantly compromised. Being depicted on a duel auto card or have jersey clipping or 1/1 or whatever should be a privilege, not a right. Do great things on the field, build a positive reputation and the hobby credits you with autograph/memorabilia privileges, which in turn may result in larger annual bonuses (i.e., bigger pay checks). Positive Reinforcement might even give players additional incentive to improve and maintain their skills. Re-introduce competition. Topps owns the rights to produce baseball cards for the 2010 fiscal year. Topps is also the only one that has these rights. There are significant pros and cons to this little fact. Fact: Michael Eisner, the former CEO of Disney, owns Topps. Hopefully, Eisner will figure out a way to make the hobby kid friendly again. When I was a kid, I had many peer friends who were collectors and we would storm through shops and shows all the time buying whatever we could afford. Today, all I see are adults (which isn’t a bad thing). All I’m saying is that there’s still an entire demographic of potential buyers out there just waiting to be re-introduced to the hobby again. Additional market segments = increased profits! Let’s move onto the meat; the Pro’s and Con’s of monopolization. Pro’s: no competition, you can do whatever you want w/o fear of other brands influencing your product sales, no price wars, no constant competitor watch and analysis, no need for benchmarking. Con’s: no competition means potential customer manipulation, complete hobby control, price markups, hindered creativity (no incentive to produce quality products when there are no competitors), fewer options for the consumer. If the customer doesn’t like Topps, they are out of luck and may as well pick a new hobby at that point. The hobby could use a few tune ups. Adjustments are continuous and progression is a race without a finish line. It’s an appropriate simile for such an elastic market. Although trends come and go, if new trends aren’t introduced from time to time, interest levels will dwindle and the hobby will die. Human’s require novelty to maintain interest. Keep it fresh and different and you can’t go wrong. It’s like that drive home from work or school that we take everyday. If you keep taking the same route over and over and over again, you will eventually not even think about the drive at all because the very event of the drive will cross over from habituation to automation. This is when the potential for danger increases significantly. In contrast, if you simply change up your route every few weeks, your awareness and familiarity with your surroundings will sharpen and this will keep you safe on the road. Take home point here: keep it fresh or die. What was your first pack pulled autograph? Hello-I really liked your comments on the 1990 Upper Deck Reggie Jackson card. I was one of the lucky folks who pulled one from a box way back in 1991 or ’92. I immediately bought a “hard” plastic cover for it and have kept it all these years inside a small box. So recently I sent it in to Beckett and got it graded. It came back with 1 “9”, 3 “9.5’s” and “10” on the autograph! It’s #1160 out of 2500 and is just beautiful. I’m a new eBay seller and just don’t know what to ask for it! Any ideas of where I can “compare” or do some good research to know a fair asking price on eBay? Thanks. did you get any mike witt’s or scott ruskin’s in your 1990 upper deck packs ? i have one those cards i got it in a pack at the corner store in my town. i also went out the day i got it and put in a case. it has been in a saftey deposit box since the day i got. i havent seen the card in over 10yrs. what lead me to this site was i was interested in its value. to say the least im not impressed with its value i believe when they came out they were around 500. looks like i will be holding onto that one for yrs. Nice pull! This is an ultra scarce card so hats off to your luck. It’s pretty impressive that you can go so long without looking at it, the card is such a beauty. Thanks for reading. I was 13 when the 90 Upper Deck high numbers hit the market, I remember just ripping open box after box after box like a mad man looking for one of these to pop up and it never did. It became almost a addiction in itself as a young kid looking for it. Such great memories I will never forget. I was like that with all the insert’s back then. I would , out of all the insert cards from the early 90’s as a kid the only ones I ever pulled out of packs were the 1990-91 pro Set Stanley Cup Hologram, a howard Johnson 92 Donruss Elite card, and a handful of pro line auto card but they were not to card to find at all the pro line auto cards. You are 100% correct all the insert autos from the early 90’s are almost impossible to find becasue of the high number of production back then. People use to open 24 box cases back then one after another and never pulled one. A kid buying a few packs to a box had better odds of hitting the lotto then pulling one of Upper Deck Heroes Autos from the early 90’s it seemed like ? I ripped a ton of this stuff as a kid as well and never got a Reggie auto either. To my knowledge a small percentage of total print run was inscribed with the “Mr. October” title. I have never seen a copy surface, but I am aware of its elusive existence. I don’t remember the TV commercial for Upper Deck marketing the Reggie chase, but would love to see it. The tag line, Find the Reggie still applies in today’s market. I always think of this card when I see unopened packs of 1990 Upper Deck. Does anyone know if all 2500 autos were pulled? There really isn’t any easy way to know for sure. Personally, I bet there are still quite a few left in packs. I was one lucky guy to have pulled a Mr October right after they came out. I have had it put away and am going to send it in shortly for grading. I lived in Washington State, and was offered up to $1500.. I have gotten many signatures over the years including Michael Jordan, and Nolan Ryan. I even had the honor to have an unopened pack with Michael Jordan’s rookie showing through the pack. I sold them all except for my Reggie card. Since it was my first signature card and the first signature card to be put in packs, it might be a while before I can sell it. Wow! Congrats! That’s a really impressive pull. I know very few people who have been lucky enough to have pulled this card from a pack. Every time I hear it, it shocks me. It’s such a rare item. Thanks for reading and sharing your comment.